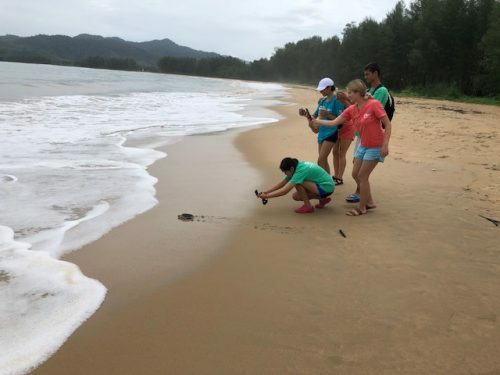 At the Royal Thai Navy Third Fleet Sea Turtle Nursery, green turtles are collected as tiny hatchlings from the wild and are returned to the sea once they’ve grown bigger. This practice, called headstarting, is done in the hopes that the larger turtles will have a better chance of surviving than the easily hunted newborns. Usually the center only releases turtles on special occasions or holidays, so our DukeEngage team spends most of our time scrubbing tanks, cleaning turtles, and helping to collect data on the animals. But a few weeks ago, just as we were finishing lunch, a staff member came up to us with a plastic basket. In the basket were two juvenile turtles, around five months old, that we were to release that very afternoon. 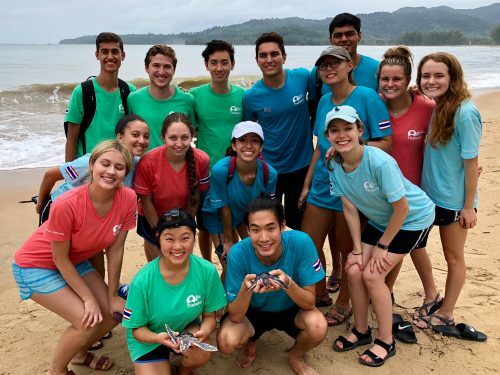 DukeEngage Thailand 2018’s turtle release! We were beyond excited. We knew how important it was to get these little guys back out into the wild. While it was necessary for them to grow bigger in captivity, keeping them for too long could impact how well they adapt back to the ocean. 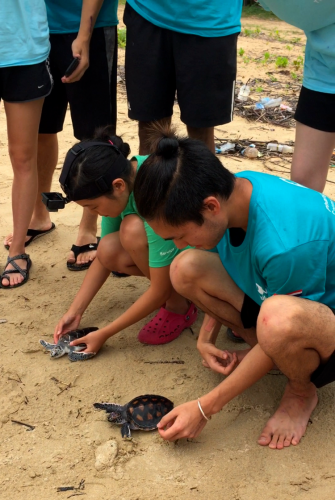 We set the turtles down on the beach and let them find their own way to the sea. They crawled forward with their little flippers to where the waves lapped at the sand; then in one sweep of foamy water they were gone, back to the big blue that they came from. Joseph Hsiung and I officially releasing the turtles. The funny-looking setup on my head holds a camera that filmed the experience. The humbling experience reminded us of why we had joined a program with a focus on conservation. We only released two turtles that day, but hopefully the center will release more and more in the future. It’s inspiring to think that the work we do today will carry on after we leave, and could make a big difference in the lives of these amazing creatures. To the two turtles we released: Good luck out there! And … DukeEngage staff member Thomas Phillips took photos of the DukeEngagers taking photos!